A victim of heart failure, one of the greatest personalities in the history of fighting, Carlson Gracie died on February 1, 2006 in Chicago. According to Dr. Mauricio Consalter, chief of the medical staff who recieved Carlson at the Lincoln Park Hospital, in Chicago, on Thursday 26, Carlson came to the emergency room at night with about 8 days history of bladder and kidney pain, also alteration of mental status, deep cardiovascular and septic shock on exam, diagnosed with sepsis, generalized infection, a bacteria went to his blood stream from a urinary infection, antibiotics, vasopressors, fluids were given. Carlson was persistently critical, but slowly improved, and on the 31st of January he gave signs of good recovery, his pressure was under control, his heart rate was perfect, he had no fever. But at 6 am Chicago time, his heart slowed down and he went into full cardiopulmonary arrest, he was entubated, cardiac massage provided, but after 40 minutes of no heart activity, was declared dead. Eldest son of Carlos Gracie, the man who brought Jiu-Jitsu to Brazil, Carlson was launched by the family in the challenge against Waldemar Santana, who had defeated uncle Helio in the anthological bout that lasted 3:40h, held in 1955. Six months later, at 21, he would go into the ring in order to avenge the uncle in little less than 40 minutes, in a bout the press depicted as “a massacre.” This would be the first of four fights against Waldemar (two wins, two draws) in Carlson’s record of 19 professional fights, with one loss. After retiring from MMA, Carlson dedicated himself to teaching Jiu-Jitsu, and his team reigned supreme in the tournaments held from the mid-1970s to the mid-1990s. He raised such black-belts as Sérgio Iris (“Serginho de Niterói”), Cássio Cardoso, Peixotinho, Ricardo de la Riva, Murilo Bustamante, Amaury Bitetti, Ricardo Libório, Zé Mario Sperry and Wallid Ismail, amongst 200 graduates. Controversial, loud talker, always gesticulating. With of an exotic taste that ranged from French music to cockfights, owner of a fantastic memory, master Carlson suffered a tremendous shock in 2000, when his elite fighters left the academy on 414 Figueiredo Magalhaes street, in Copacabana, and assembled Brazilian Top Team, after arguments concerning percentages of the fights’ purses. Some followers, however, stood by the red-belt until the end, like Oswaldo Paquetá, Wallid Ismail and Luis Carlos “Manimal” Matheus. Carlson Gracie’s sudden decease moved the fight community, dismaying followers, rivals and admirers. They all now miss the man who treaedt everyone as a son, and despite deserving honours of a hero, would dismiss any sort of blarney with the modesty of a fisherman. All of Carlson’s footsteps in and out of the ring, including his struggle with death, will be detailed in GRACIE Magazine’s 109th issue, a special edition dedicated to the grandmaster. February 18th, on Brazilian newsstands. Also available on Graciemagshop.com. 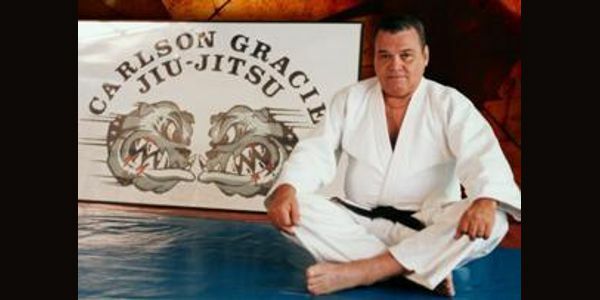 Stay tuned to GRACIEMAG.com and they will soon bring you further information on Carlson Gracie, Sr.